Today I would like to share what you can see from the F1 GrandStand area. Before that I would like to thank LG again for the ticket and hospitality provided. If you've missed my previous post about Wonder Girls at LG Technologies Design Center, click on the link and read it now~! You will know how much is a GrandStand ticket too. 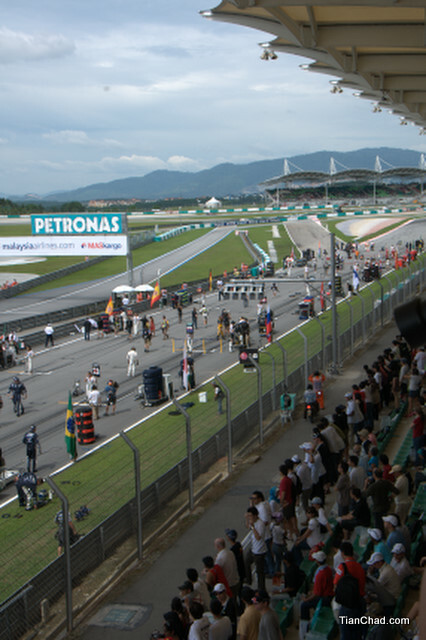 At GrandStand area you can see the prize giving platform from far and ALL Racing car s gathered at one spot. Every car team including the Redbull bring in all the stuff they need for the race. Each car team has a pretty lady standing for them. They need to smile whenever cameraman want to take their picture, under the hot sun some more! I hope they have enough sunscreen to protect their skin. Luckily there are people who giving the ladies water to drink. If not someone will get faint. 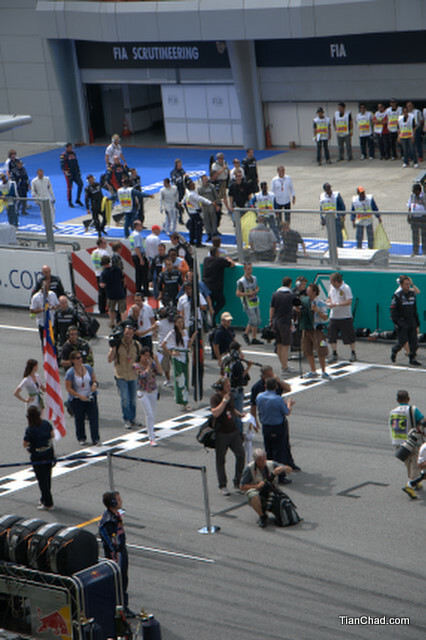 Big bunch of media were allowed to get on the track for photography and interview. Redbull team - M. Webber or S. Vettel ? "Hey bro, are you read?"" "Here is some ice for you"
Okay, our Malaysia BIG guy is here, Prime Minister Datuk Seri Najib Razak. Accompanied by so much people. All the people on the race track looks like a bunch of ants looking for foods. Just that they are different kind of ants. It took quite long for them to prepare the race car, change the tyre, check the balancing, and everything they need to let the racing car perform at its best. Looks like Nico Rosberg has minor hair loss at certain area on his head; It doesn't affect his performance to get in top 3. Every driver has a personal servant that will full fill his need. It is like Aladin without the lamp. Mark Webber coming out with his own style. They are ready to have the first round as test run. That time only I know I MUST wear the earplug. The noise is killing my ear! 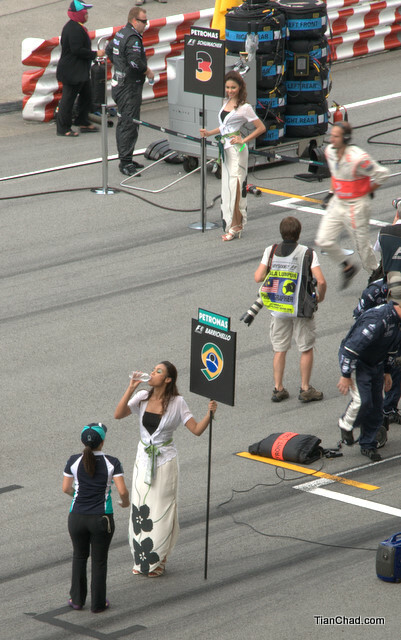 Last picture for what I saw at the GrandStand before the race begin. Before I end this post I would like to share a 30-seconds video on what you can see from a Grand Stand view. Enjoy! Next coming post for F1 I will share my outcome of doing the panning shots during the race. 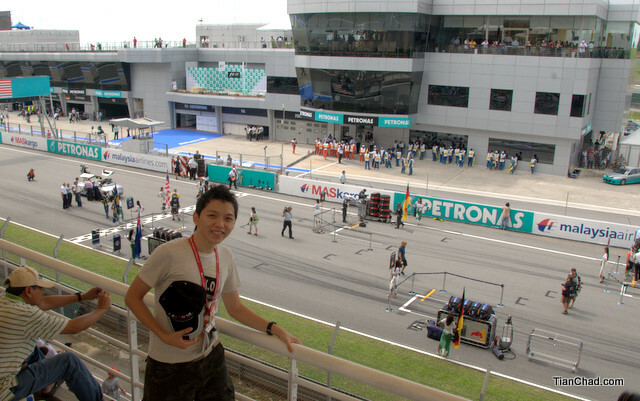 Wish I manage to share my experience with you guys about what you can see at the Grandstand~! Cheers!